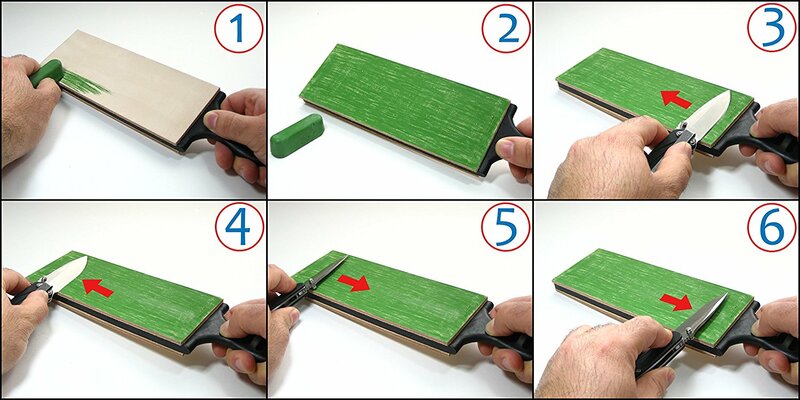 Using a sharpening stone can be a little overkill if all you really need is a little touch up before your knife is ready to go again. Which is why the best leather strop will allow you to fix anything from blemishes to rolled edges in seconds. Frequently used with compound, these fine abrasives are what can give a mirror polish to an edge. We determined the best leather strop to use for wood carving tools is the Garos Leather Paddle Strop that comes with white, green, and red compounds. First you must apply your compound (black, white, red, or green) to the leather strop, a little bit goes a long way so there is no need to cake it on there but do make sure the strop is covered in the compound. Lay the bevel against the surface of the best leather strop and apply light pressure and begin moving the blade away from the cutting edge. Flip the blade to the opposite side and repeat the process. It’s important not to move the blade toward the cutting edge because it will cut right into the strop, which will cause dulling of the balde and ruin the best leather strop. Four to six strokes is enough to get the job done.